PSALMS 37:23 KJV "The steps of a [good] man are ordered by the LORD: and he delighteth in his way." 20But the wicked shall perish, and the enemies of the LORD shall be as the fat of lambs: they shall consume; into smoke shall they consume away. 21The wicked borroweth, and payeth not again: but the righteous sheweth mercy, and giveth. 22For such as be blessed of him shall inherit the earth; and they that be cursed of him shall be cut off. 23The steps of a good man are ordered by the LORD: and he delighteth in his way. 24Though he fall, he shall not be utterly cast down: for the LORD upholdeth him with his hand. 25I have been young, and now am old; yet have I not seen the righteous forsaken, nor his seed begging bread. 26He is ever merciful, and lendeth; and his seed is blessed. A man's goings are established of Jehovah; And he delighteth in his way. The steps of a good man are ordered by the Lord, and he takes delight in his way. A man's goings are established by Yahweh. He delights in his way. It is of the LORD that a man's goings are established; and He delighted in his way. 37:23 Established - So that he shall not fall into mischief. There is none good : only one : That is God : I am the righteousness of God in Christ Jesus : Therefore God dwells within me : So to my understanding I have some good in me : God : My steps are ordered of the Lord through His word and the unction of His Spirit within me. To delight in his way is to be obedient to His word and the unction of Holy Spirit within. Also , if I notice that the word God is italicized : That means it was added to give better understanding to the subject being said. The steps of a man are ordered of the Lord and he delighted in His way. A good man: One who has been granted righteousness because He has received Jesus' sacrifice. If this is not true then my question is, how does one know when he has achieved enough goodness on his own to merit God's blessings? Steps are ordered by the Lord: I believe this is in reference to God giving direction to the believer by revealing His Word to him/her about a situation(s) or by giving information needed to be victorious in whatever situation one is facing. 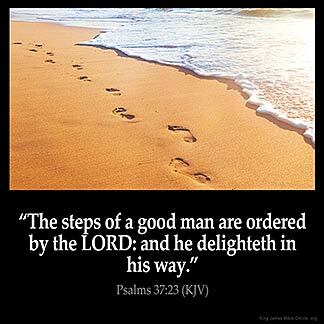 Ps 37:23 The steps of a good man are ordered by the LORD: and he delighteth in his way. First and foremost how does man become good even before God? Secondly how does God order the steps of This good man? a) Luke 8:15 But that on the good ground are they, which in an honest and good heart, having heard the word, keep it, and bring forth fruit with patience. The heart must be made good to produce fruit, since it was eroded of its goodness through adamic sin, the sin of disobedience. This can only be achieved through receiving Christ as ones personal saviour, receiving forgiveness of sin and cleansing from all unrighteousness through the blood of Jesus Christ our Lord. This is the beginning of the new life. If a good heart starts from hearing and being convicted of the word of God toward receiving Christ as one's personal saviour and this is what makes a good man therefore I conclude by saying what orders the steps of this good man is the word of God. It is the word of God that will keep you away from falling if you obey it. My father always said ,your word is your bond!